2013, Personal Project | One of the most common reasons people don't recycle is because they just don't know where the closest recycling spots are or they don't know that certain things can even be recycled to begin with. 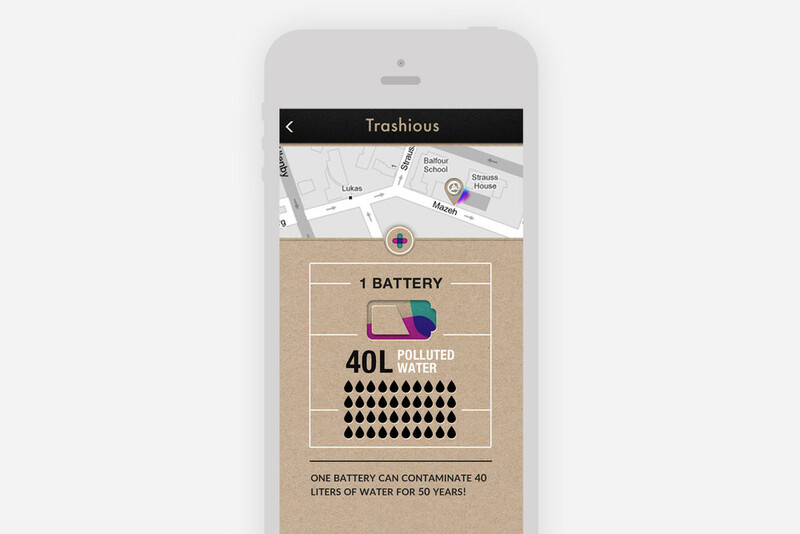 This is why I came up with Trashious, an app in which the user can select an item to recycle and find the closest appropriate recycling spots for it. The location map appears with a changing infographic section, presenting facts about the meaning of recycling a single item of this kind. This provides the extra "push" to go and recycle, even if it's just a small amount of waste, because every small action has a significant effect. The icons style comes from thinking about the idea behind recycling without using the conventional recycling "language" (green, recycle symbol). The shapes contained in every icon reflect the material potential behind every product and the never ending possibilities of recycling - it's like building blocks which can be deconstructed and reconstructed into something new.